Have you ever gotten an iced tea in a can, grabbed a Gatorade after a hard workout, or a big bag of pretzels and consumed the entire thing? Chances are if you read the label you would have consumed 2 to 3 times the recommended serving size for that product. When you read a Nutrition Facts Label, be sure to check how many servings the product contains. This way you’ll have a more actuate grasp of how many calories you’re consuming. While you should aim to keep total calories from fat to about 30% or less per day, only 10% or less should come from saturated fats. Saturated fats are one of the main causes of increased plaque in the arteries. This may lead to heart disease and other cardiac problems. Most women should have no more than 15-17 grams sat fat per day. So go for products low in saturated fat! You may think that salt is only found in the salt shaker, but many packaged products have added sodium, sometimes for flavor, sometimes as a preservative. According to the Centers for Disease Control, the average American consumes more than twice the amount of sodium than they should. The American Heart Association recommends foods with little or no salt to reduce the risk of cardiovascular diseases. Aim to eat less than 1,500 mg of sodium per day and always check the label to know how much you are consuming. If you see hydrogenated oils or partially-hydrogenated oils in the ingredient list, put it back on the shelf. Products that contain them are chemically altered so the oils they will be solid at room temperature, but soft and malleable. These oils, also known as “trans fats” can be harmful to your health. In clinical studies, TFA or hydrogenated fats tended to raise total blood cholesterol levels. Some scientists believe they raise cholesterol levels more than saturated fats. TFA also tend to raise LDL (bad) cholesterol and lower HDL (good) cholesterol when used instead of cis fatty acids or natural oils. These changes may increase the risk of heart disease. And buyer beware: Even if the Nutrition Facts Panel says 0g trans fat, but had a hydrogenated oil listed in the ingredients, it will contain trans fat. 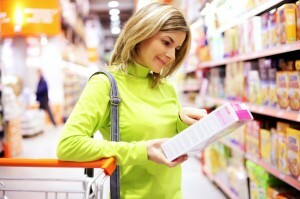 Challenge yourself to find packaged foods that contain less than 15 ingredients. If you start seeing several paragraphs under the ingredients list, you’re probably looking at a highly processed food. Ingredients are listed according to decreasing quantity, so if you see “sugar” as the first ingredient, you’ll probably want to skip it. Next time your searching for a snack or meals for the week, remember to check the labels with a pros eye! This post was written by AppforHealth.com intern, Alexandra Babcock. The information regarding saturated fat is incorrect. That has been our thinking for a long time, but it has since been shown to be wrong. Saturated fat intake does not increase risk of heart disease. The AHA still recommends limiting saturated fat intake — actually to 7% or less of total calories. There are many studies (including recent studies) showing a link between high sat fat intake and elevated cholesterol levels and heart disease.